Feature：A unique viewing stone and fine wooden pedestal sculpture. It's charactizing a fine spring day. Chinese Scholar's Rocks (2*) - Desert Varnish (3*), size 29x28x56cm. 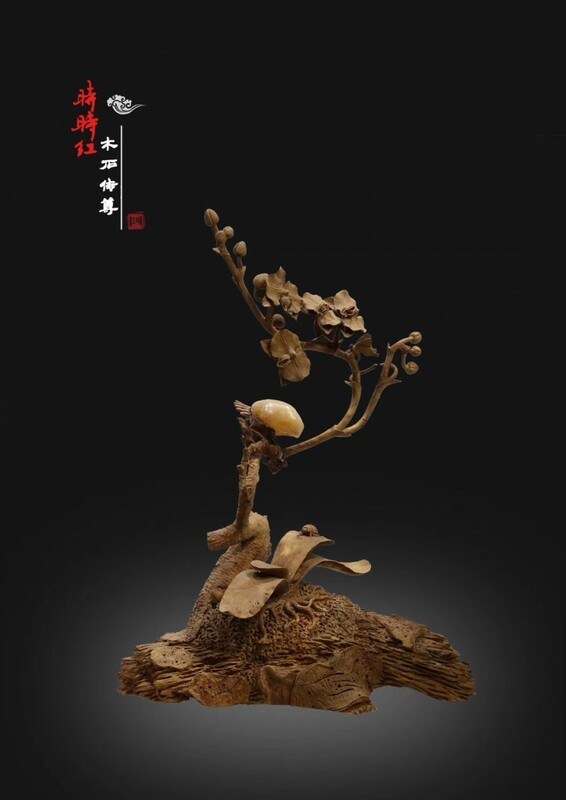 This artwork ”Singing Birds and Fragrant Flowers“ gained the "Chongxin Cup" Gold Award and Silver Award of the 4th China Zhejiang Arts and Crafts Boutique Expo. 1* Chen Shihong, the curator of Shanghai Shi Shi Hong Culture and Art Museum, Vice President of Shanghai Viewing Stone Collector ’s Association, and inheritor of Shanghai Intangible Cultural Heritage Wooden Pedestal Skills of Viewing Stone. He was born in Panan, Zhejiang. He started learning woodcarving skills since the age of 16 from Zhou Shiyin. In the past 40 years, his artworks of wooden pedestal skills have won more than 90 national awards. His honors are masters of traditional Chinese craftsmanship, Chinese rosewood artist, chief artist of the Chinese viewing stone industry, and Master of Arts and Crafts, in Zhejiang Jinhua etc. His works combine the wooden pedestal and the viewing stone well, making them unique, with outstanding and excellent "Tao" style and "Haipai" creativity. He has held an exhibition of non-relic projects in Putuo District of Shanghai, the Shanghai Big World Intangible Cultural Heritage Stones Art Exhibition, and he also has participated the second Intangible Cultural Heritage Exhibition of “Tiangong Kaiwu”, an “Small Items, Big Pedestal - Wood and Stone”Intangible Cultural Heritage art exhibition in Liu Haisu Art Museum and other exhibitions. His masterpieces include “Asking a Boy under a Pine Tree”, “Falling from Heaven”, “Harmony”, “Wood and Stone Chuan Zun” and so on. His work“Harmony” was collected by Ronald Bew of Deputy Bureau of the United States small and Medium-Sized Enterprise Administration, and Ban Ki-moon of former UN Secretary General, former French Prime Minister of Jean-Pierre Raffarin, former German President of Christian Wilhelm Walter Wulff and other world leaders. His other work “Qi Shi Min” was collected by Mr. Li Zhaoxing of former Foreign Minister of the People’s Republic of China, and Gary Faye Locke of former Secretary of Commerce of the United States. 2* Chinese scholars' rocks, also known as scholar stones or viewing stones, are naturally occurring or shaped rocks which are traditionally appreciated by Chinese scholars. Scholars rocks can be any color, and contrasting colors are not uncommon. The size of the stone can also be quite varied: scholars rocks can weigh either hundreds of pounds or less than one pound. Chinese scholar's rocks influenced the development of Korean suseok and Japanese suiseki. 3* Desert varnish is the thin red-to-black coating found on exposed rock surfaces in arid regions. Varnish is composed of clay minerals, oxides and hydroxides of manganese and/or iron, as well as other particles such as sand grains and trace elements. The most distinctive elements are manganese (Mn) and iron (Fe). The sources for desert varnish components come from outside the rock, most likely from atmospheric dust and surface runoff. Streaks of black varnish often occur where water cascades over cliffs. No major varnish characteristics are caused by wind. The color of rock varnish depends on the relative amounts of manganese and iron in it: manganese-rich varnishes are black; iron-rich varnishes are red or orange; varnishes with similar amounts of manganese and iron are some shade of brown. Varnish surfaces tend to be shiny when the varnish is smooth and rich in manganese.